Magisto, a cloud-based iOS app that uses Artificial Intelligence to automatically mix your iPhone photos and videos into movies, has unveiled a new trick: Surprise Me. This new feature — part of an update to the free app — uses AI to create original videos, but this time independently and without your input. With the aptly named Surprise Me enabled, the app will now sort through your old content and splice it together into its own production. The new feature automatically determines when enough new media has been added to an event, analyzes the content, combines photos and videos of its choosing into a video, and send you an alert. Some people are meticulous about what they carry around on their phones. But with so many photos and videos shot every day, it’s hard to keep track of everything, no less put some favorite photos and clips to good use. Surprise Me can take care of that part, digging into past content you may have forgotten about and bringing it back to life. Surprise Me analyzes a user’s camera roll to choose from current and past events to create a brand new video. Unlike the familiar app, which lets you choose your clips and from among the app’s themes and music, Surprise Me taps into the Magisto’s emotion sensing technology to generate that part of the presentation for you. 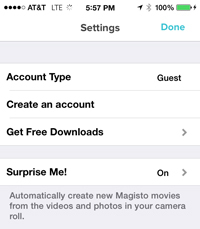 The number of Surprise Me movies that Magisto generates will depend on the individual user’s activity and level of content. When a movie is created, users get an alert. After viewing the movie, they can keep, delete, add to or share it. The Surprise Me feature has been available in beta to Magisto users since April, and was rolled into the app’s update today.